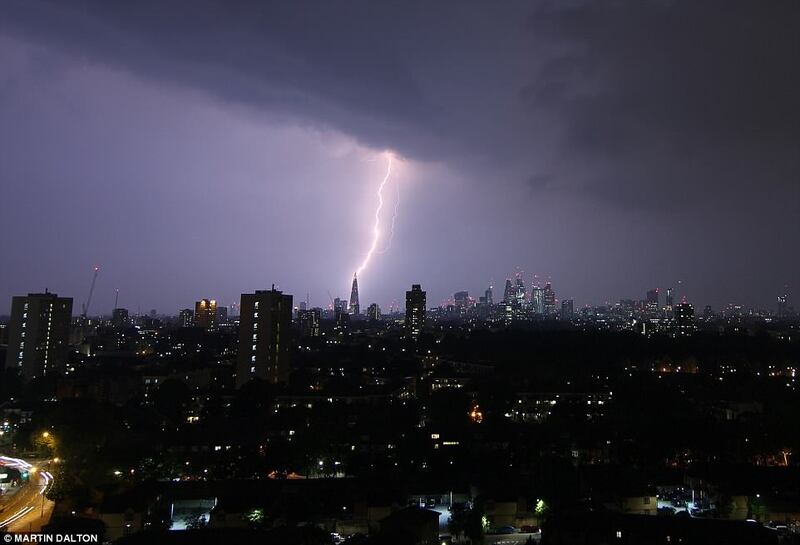 A lightning bolt came perilously close to hitting a plane on Sunday as Britain was hit by a second successive night of powerful thunderstorms and torrential downpour. 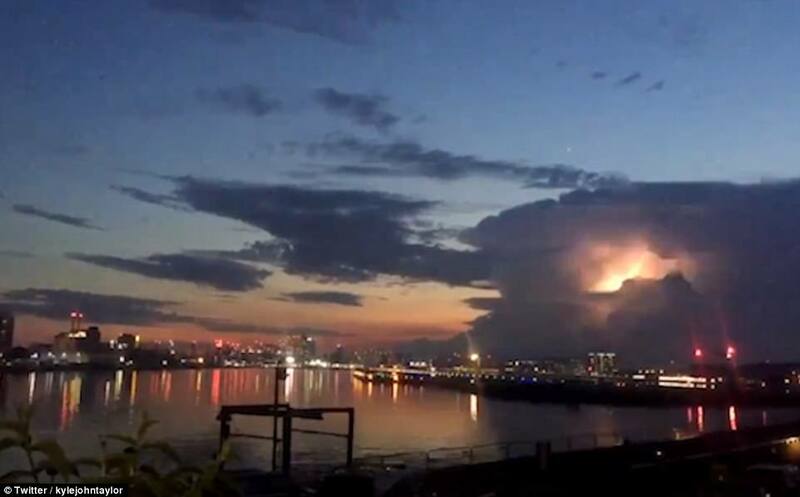 Hundreds of bolts of lightning lit up skies across the UK as the volatile weather forced Britons to baton down the hatches and seek shelter, despite stifling humidity and 80F temperatures continuing to creep up. Despite the ominous yellow weather warnings, the UK could be set for the hottest day of year today - with the sun reemerging in time for Bank Holiday barbecues, all day drinking and al fresco dining. But he said the torrential rain had been 'very localised', pointing out that another site 10 miles away at Coleshill recorded just 3mm of rain in 12 hours. 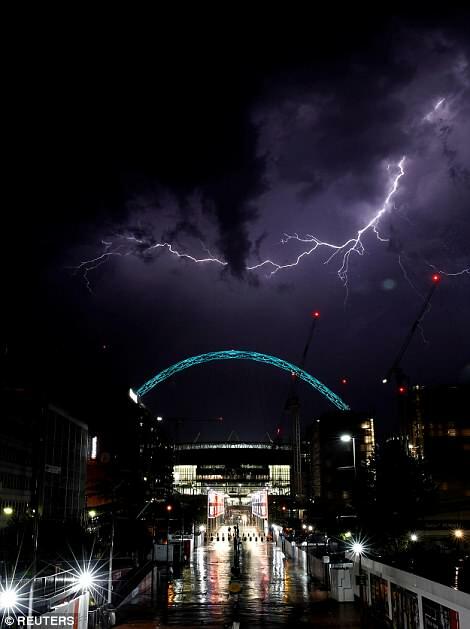 Mr Snell said: 'We won't see the scenes we saw last night. 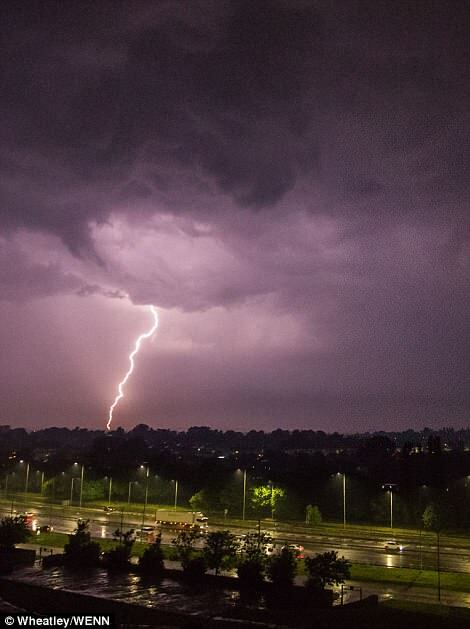 Southern England was struck by lightning between 15,000 and 20,000 times on Saturday night into Sunday morning. The Environment Agency has more than 20 flood warnings and more than 40 flood alerts in place covering much of Central England. A yellow weather warning for rain is also in place from the afternoon for large swathes of East Anglia, the South East including London, the South West and Wales. 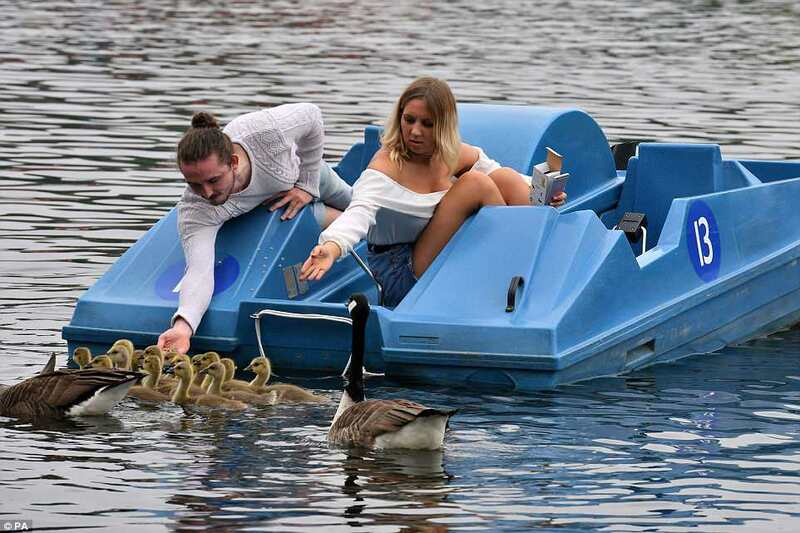 But Mr Snell said temperatures could hit highs of 28C or 29C in the South East, potentially surpassing the 2018 record of 29.1C on April 19 in St James' Park, central London. 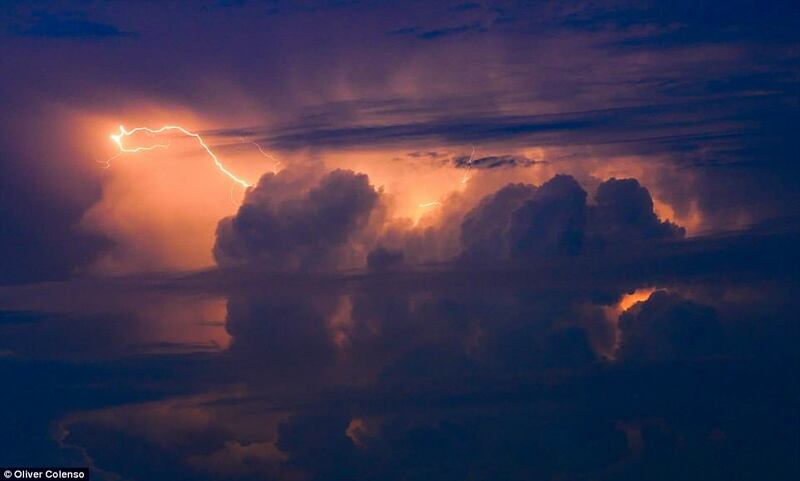 He said: 'It all depends how much cloud develops. There's a chance we could see the warmest day of the year. 'It will be quite widely into the 20s across many parts of the UK. For a bank holiday Monday, it's not looking too bad. 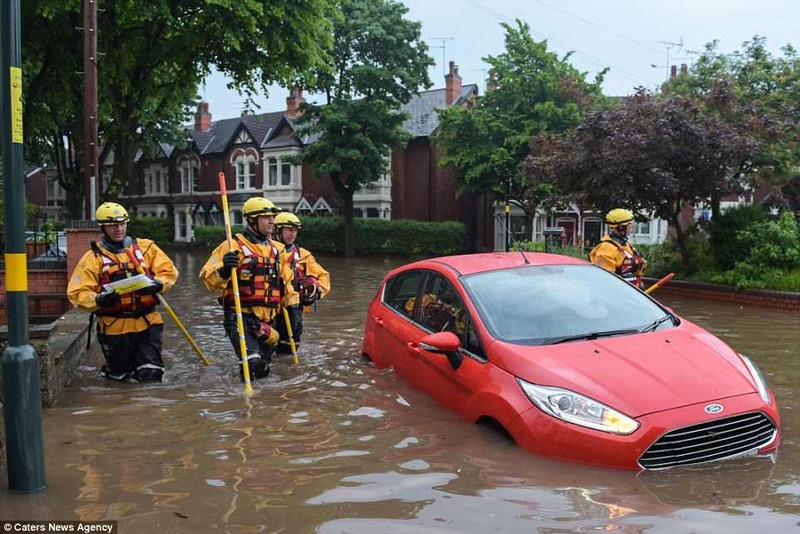 On Sunday, residents in Birmingham were caught in flash floods as torrential rain poured down across the Midlands. 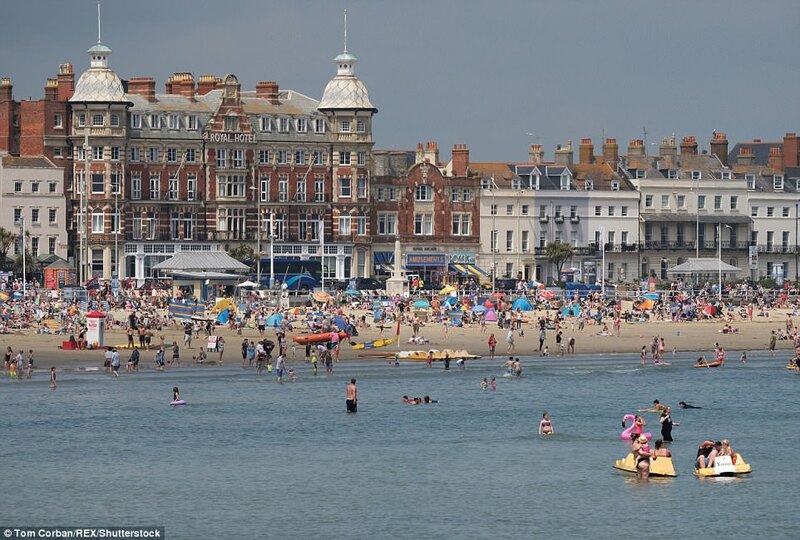 Over the weekend, crowds descended on Weymouth beach in the South East as families raced to secure prime sun bathing real estate amid soaring temperatures and clear blue skies. 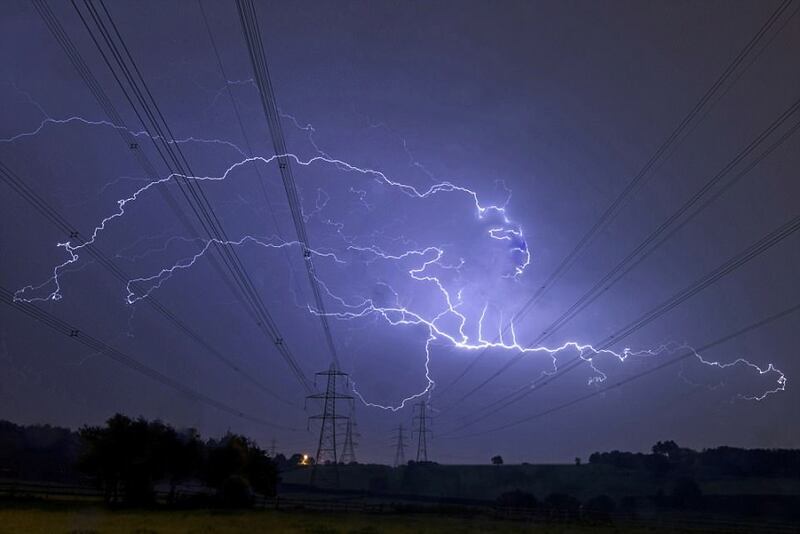 More than 62,000 lightning bolts blitzed Britain in the 'lightning show of a lifetime'. 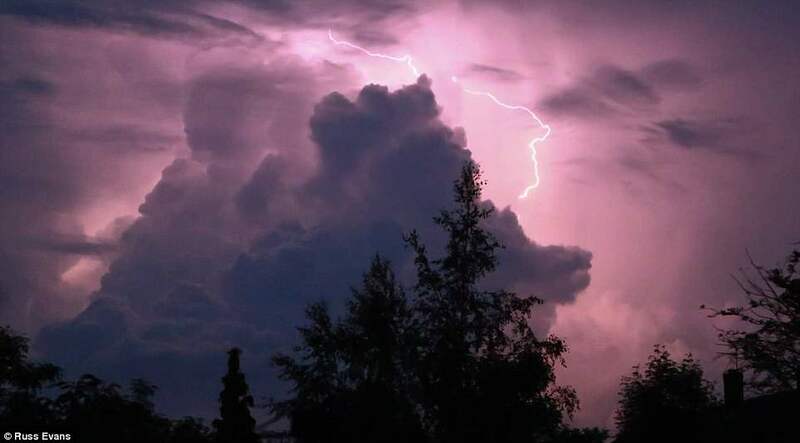 Lightning hit the south east before midnight with thunderstorms then striking Wales and the rest of England in the early hours of yesterday morning. 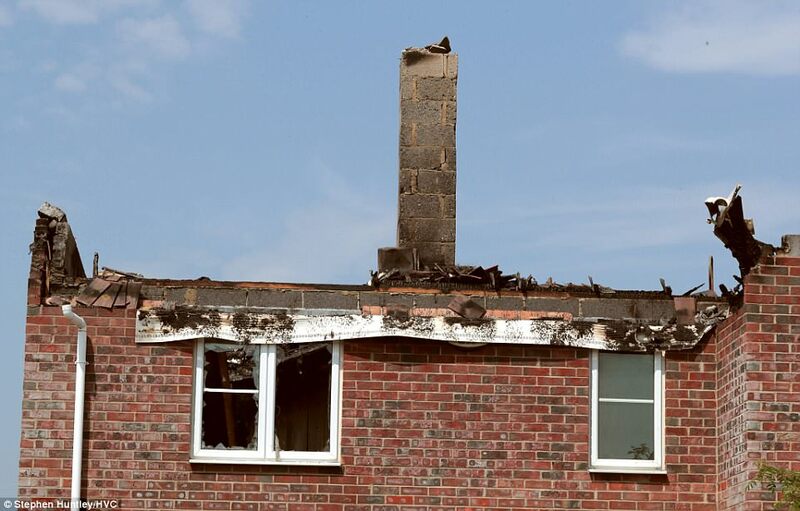 One house in Stanway, Essex, had its roof completely destroyed when it was struck by lightning and erupted in flames. 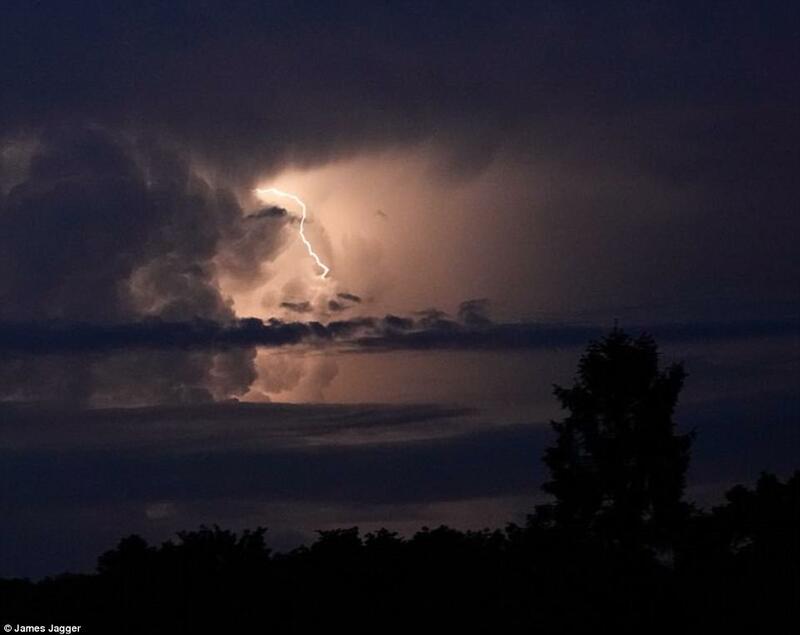 While passengers were left stranded on planes for hours at Stansted airport after flights were cancelled and grounded following a lightning strike hitting a fuel tank. 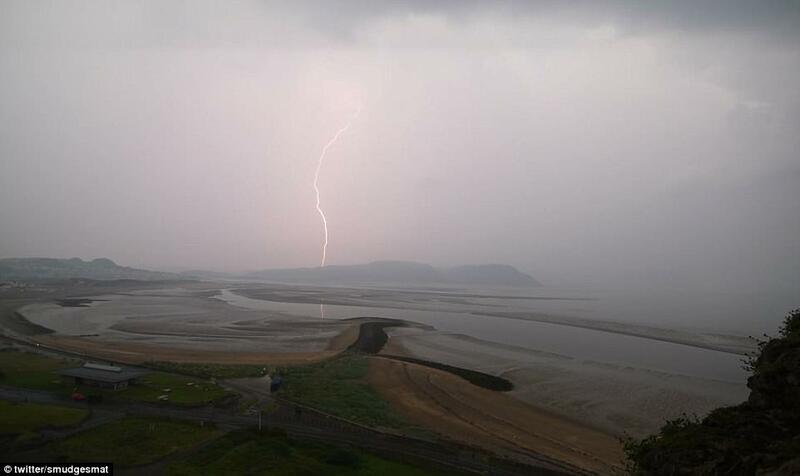 Scotland and Northern Ireland escaped the worst of the bad weather. Essex County Fire and Rescue Service sent three vehicles to attend the fire in Stanway last night at 1:38am after lightning hit the roof of a property. 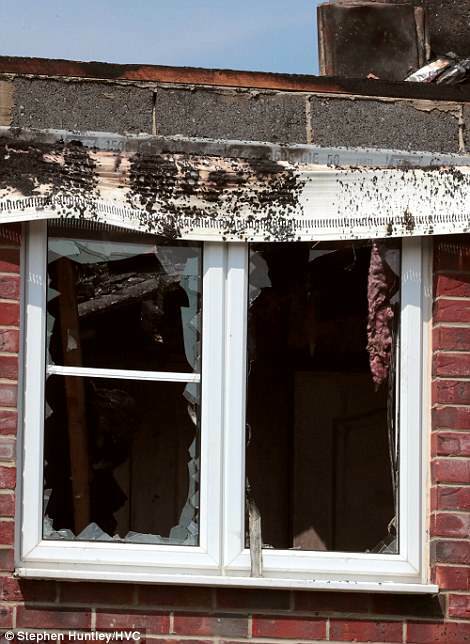 On arrival fire crews discovered that the 'entire roof of the detached building was alight' and had to spend three hours at the home. 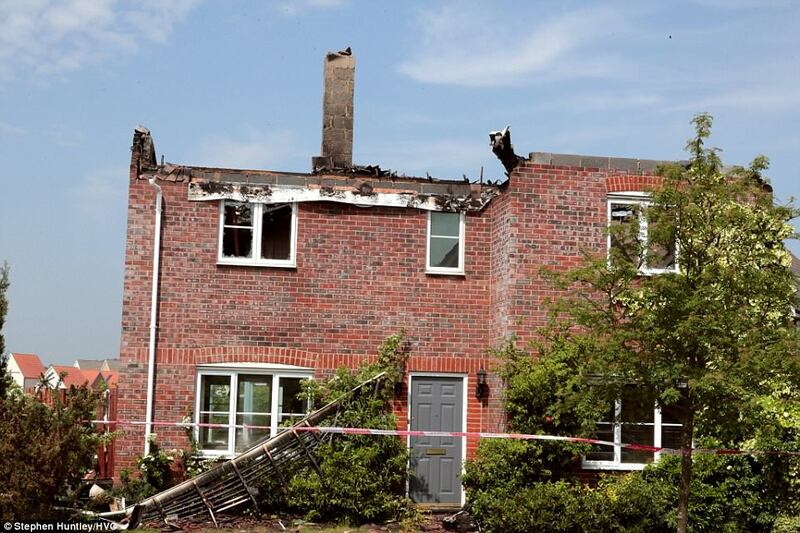 No-one was in the property at the time of the lightning strike and it is believed the home owners are on holiday. The roof has been destroyed while most of the house itself has also been affected by fire damage. 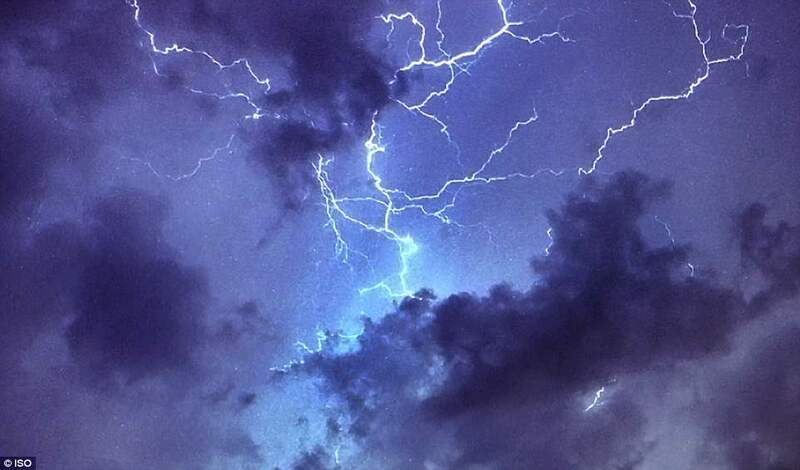 The 62,598 lightning bolts that hit Britain in a 24-hour period recorded until 9am Sunday is 20 times more than an average lightning storm's 3,000 strikes, Met Office data shows. 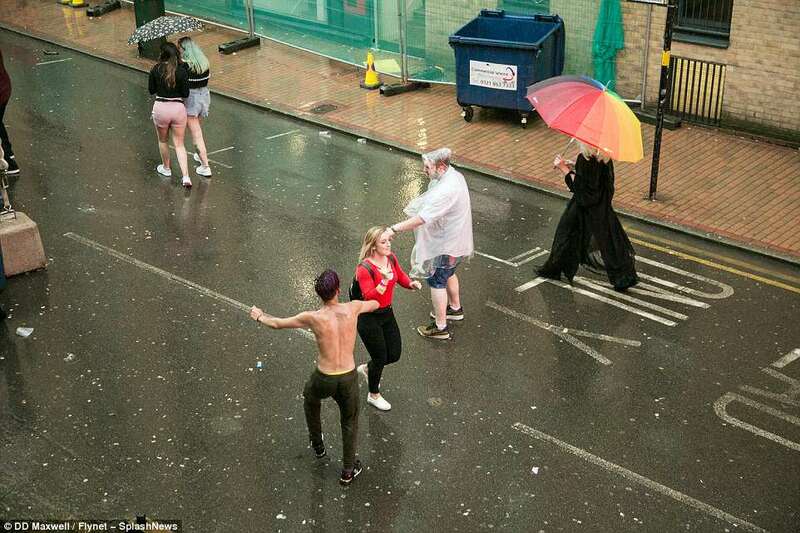 The London Fire Brigade said it had taken more than 500 weather-related calls as the warm and humid bank holiday weather broke down into an 'utterly intense' storm. 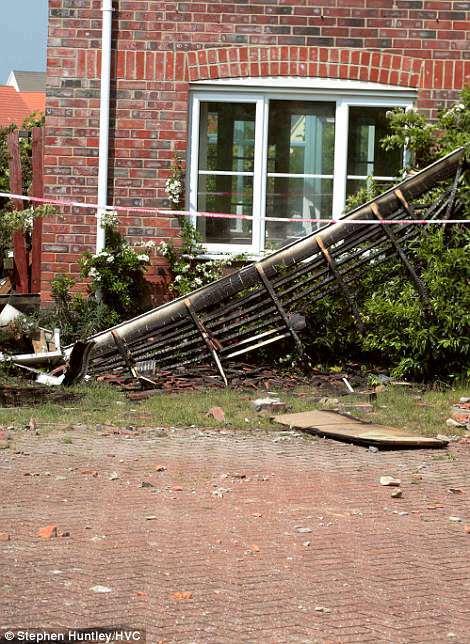 In Warwickshire, the fire service said five properties were struck by lightning in the early hours of Sunday, while in Dawlish, Devon, a telephone box burst into flames after a BT pole was hit on Saturday evening. A cluster of 17 flood alerts has been issued for parts of the Thames Valley, while West Midlands and Bedfordshire fire services warned motorists of the risks of driving on flood-hit roads. 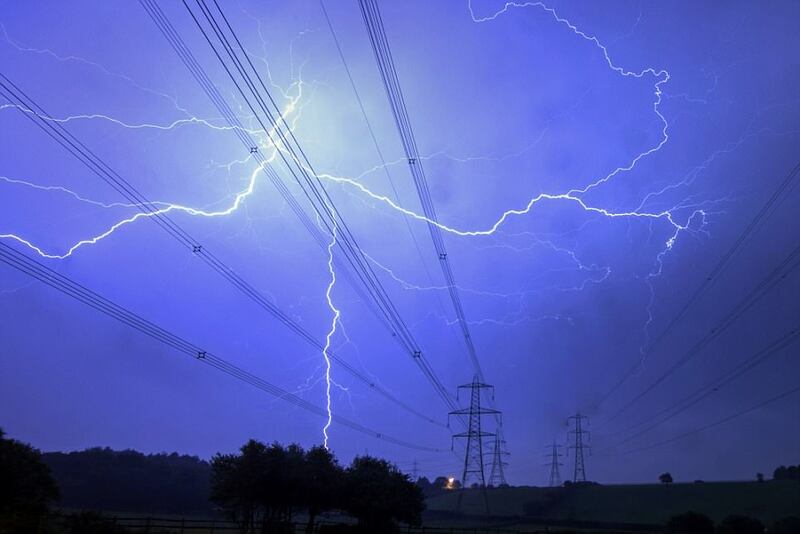 Western Power Distribution said nearly 1,000 properties had been left without power across the Midlands, with the majority of outages down to lightning. The 62,000 strikes contained 15million kWh of energy - enough to boil water for 600million cups of tea, lightning and energy data showed.